We are highly acclaimed in the industry for trading an optimum quality range of Adjustable Spanners. We are Leading Supplier & Wholeseller offer Adjustable Spanners which are handy tools used for loosening, tightening or fixing any kind of nuts and bolts. These have a jaw which is the part into which the nut or bolt goes. Our spanners are offered with adjustable size, which allows different sized nuts and bolts to be handled by the same spanner. We Priya Components deal with Taparia Tools. 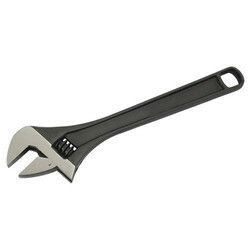 To meet the needs and requirements of the clients, we are offering a quality approved array of Adjustable Spanner The Adjustable Spanner we offer is widely demanded for its sturdiness and supreme quality. Besides, these products are known for their sturdiness. Finish: Phosphate & Ni-Cr. Plated. Size: 110, 155, 255, 305, & 380 mm.